Download and print out this crossword puzzle for a fun Hanukkah family activity. Try this family's unique way of engaging children in tikkun olam by helping the homeless. Sadie loves to climb. She will climb on anything. This annoys her big brother throughout his family’s Hanukkah preparations. While shopping for ingredients to make dosas (savory Indian pancakes), her big brother discovers a musical way to talk Sadie down from the heights. 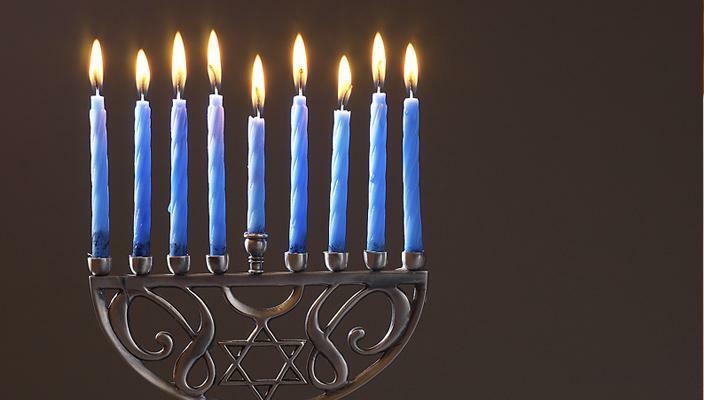 Here are eight questions to kindle your enthusiasm about Hanukkah music. Take the quiz and see how well you score! These Playlists Will Keep You Rockin' All Hanukkah Long! Whether you're hosting a holiday party or simply want to turn on some Jewish tunes as you light the candles with your family, our Spotify playlists will do the trick. Hanukkah is a joyous time of year – full of light, fun, and cool new projects. Hanukkah recounts the story of a great miracle and a great triumph, offering parents a wonderful opportunity to teach children to celebrate the miracles in their own lives as well as to be the light in someone else’s darkness. We made this keepsake on the last night of Hannukkah last year. As a fairly new family, making this took all three of us, including our four month old, and was such a fun way to introduce our daughter to Jewish culture! Lighting an oil lantern is a wonderful way to illuminate your retelling of the story of Hanukkah. As you create a symbolic reminder of the cruse of oil that was found in the ancient temple you are also creating a new family tradition. At a dreidel-making workshop, Jeremy’s friends think that he is molding a secret code on his clay dreidel. However, they soon find out that he is really making a special gift: a dreidel with Braille letters on it for his father, who is blind. Create a lantern to light your way as you soak in the beauty of the night air and reflect on the miracle of Hanukkah. Perhaps this might inspire a new Hanukkah tradition. This is a fun and easy activity to do by yourself or with your family. Once you've created your lantern, enjoy a nature walk observing the night sky illuminated by the glow of your lantern. Together with your children, watch these Shalom Sesame videos to learn about the story of Hanukkah. Then try some of the discussion ideas and activities recommended by Reform Jewish educators to further extend the lessons learned in the videos. Together with your children, watch these Shalom Sesame videos, then try some of the discussion ideas and activities recommended by Reform Jewish educators to further extend the lessons learned in the videos. Dreidel is the traditional game played to celebrate Hanukkah. How do you play dreidel? Read or print out this handy guide. Recite this blessing the first time you do something each Jewish calendar year (e.g., the first night of Hanukkah when you light the menorah), and to mark joyous occasions.